overview : In 2010, a musician, Watanabe Toshimi (played by Bessho Tetsuya) was planning to go back to his hometown in Fukushima to do farming. His son Toui (played by Mochizuki Ayumu) was going to re-take high school entrance exam which he had failed the previous year. Both looked forward to starting new chapters in their lives. In 2011, Toshimi had to cancel his plan because of the Great East Japanese Earthquake. His hometown was within 20 km of the Fukushima No. 1 Nuclear Power Plant. To cheer up his father, Toui who passed a high school entrance exam promised him to go to school every day. Toshimi promised Toui to make him Bento (boxed lunch) every day. For the next three years, the father and son kept their promises. Toshimi's Bento cooking advanced a great deal. 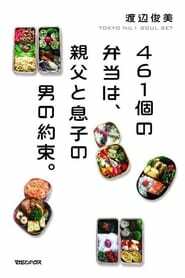 On his last day of high school, Toui took his father's 461st Bento to his school and ate it with his classmates.